To move EOS mainnet tokens using the private key from another wallet to Exodus, you must first create an EOS account within Exodus to be able to receive your EOS. PLEASE NOTE: Do not use this method unless you have complete control of your EOS funds in another wallet. The Move Funds option will only move your unstaked EOS balance from the existing wallet. If you have any questions please contact support@exodus.io before moving your funds. As a first step, make sure you have an active EOS account in Exodus. You can use this guide to create a new EOS account. Once you have an EOS account name in Exodus, you are ready to move your EOS mainnet tokens from another wallet. This will work for any wallet for which user has the EOS private key. The available funds will be transferred from the original wallet into the current Exodus wallet EOS account. If you did not have an account yet, the message will pop up: ‘EOS account required to move funds from <foreignAccountName>. 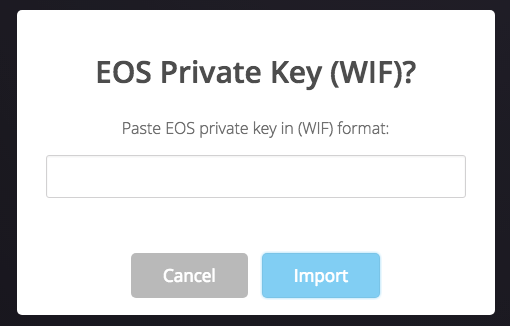 If you'd rather not import the private key into your wallet, you can also move funds into your Exodus wallet by simply sending a transaction from your current EOS wallet to your Exodus EOS "Receive" address.